A Pearl is always worthy of more admiration than it actually garners. This exquisite gemstone is the most unique ever, being the only one extracted from living creatures and requiring no faceting or polishing to reveal its natural beauty. Pearl earrings have been adding to the innate charm and charisma of a woman since the human kind can remember and have now become an indispensable part of her jewellery box. TJC brings to you the most extensive range of designer Pearl earrings in the UK, be it drop Pearl earrings, freshwater Pearl earrings studs, chandeliers or double Pearl earrings. Pearl is the birthstone for the month of June and is considered as pristine as diamonds, rubies and emeralds. The ability to blend with any kind of wardrobe seamlessly owing to its beautiful natural lustre and translucence is what makes Pearl jewellery special and celebrated across the world. Pearls can be worn across seasons, courtesy the subtle and natural hues ranging from ivory to pink, green, blue, purple and black. The silver, gold and black Pearl earrings look as dressy as diamonds and sapphires and therefore are an uncontested choice for special occasions like wedding and anniversary. The most loved form of a Pearl is the ‘Drop’, signifying the relation to its origin. Known to possess various healing properties, real Pearl drop earrings have emerged to be one of the preferred gifted jewellery items in UK. Pearl is also known to aid purity, charity, integrity, truth, and loyalty in its wearer. Quite a gem we must say! As a woman, you are required to possess a gorgeous pair of Pearl drop earrings; wear them with a chignon bun hairstyle to add that special touch of sophistication and elegance to your ensemble. Studs are the most common way Pearl earrings are donned; they go perfectly well with a messy bun or plait. Pearls stud earrings are ageless and you should own a pair in every colour, couple them with the formal attire to add the final touch to your everyday professional look. 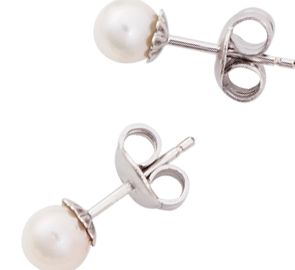 No matter how big or small your jewellery box is it always has room for a classy pair of freshwater Pearl stud earrings. TJC offers the whole range of coloured studs at unbelievable prices, complement your sense of self with an exquisite piece from TJC’s collection today. TJC designs these earrings with utmost precision and ensures that the style is a perfect amalgamation of traditional and contemporary to absolutely entice you. Wear your hair down for a high-profile evening gala with the chandelier Pearl and Diamond earrings from TJC’s collection and let them speak for your impeccable fashion sense. Diamonds are forever, the Pearls are forever and beyond, the combination of both – a legacy. The Pearl and Diamond earrings that you choose from our collection will be the best legacy you will leave behind. At TJC, we ensure that you can never say no to a Pearl. Choose a pair of earrings that defines you the best and completes your collection!